The Montblanc Star Classique Automatic is an authentic classic gold watch, featuring a slim circular design in medium size and is dedicated to those who love simple time functions and classic dials. The diameter is a contemporary 39 millimeters; a narrow bezel contributes to the visual appeal; and a moderate height of 8.9 millimeters seems even slimmer thanks to the bold inward rounding on the middle part of the case. The narrow, vertically protruding horns curve slightly downward to give this watch an anatomically correct contour that fits perfectly around its wearer’s wrist. The harmonious impression is consummated by a slightly cambered sapphire crystal which has undergone antireflective treatment on both its surfaces so that it guarantees the utmost transparency without glare. This crystal provides the ideal window through which to admire the silver-colored dial, which looks highly appealing and interesting, although its styling is uncompromisingly minimalist. A pane of sapphire crystal in the back of the case invites connoisseurs to admire the self-winding mechanical caliber MB 4810/408 with its ball-borne winding rotor and gleaming golden balance. The latter completes 28,800 hourly semi-oscillations (4 Hz) and thus ranks among the fast-paced oscillators. The view through rear window underscores the fact that a fine mechanical timepiece has charm and elegance that no quartz watch could ever rival. This caliber is the ideal power source for a wristwatch that has been reduced to the barest essentials for owners who appreciate classical elegance and inner values. The Star Classique is available in 18 K red gold and yellow gold, as well as in a gold-and-steel variant with bezel and crown made of 18 K red gold. Two steel variants with classical black alligator-leather wristbands round out the collection. 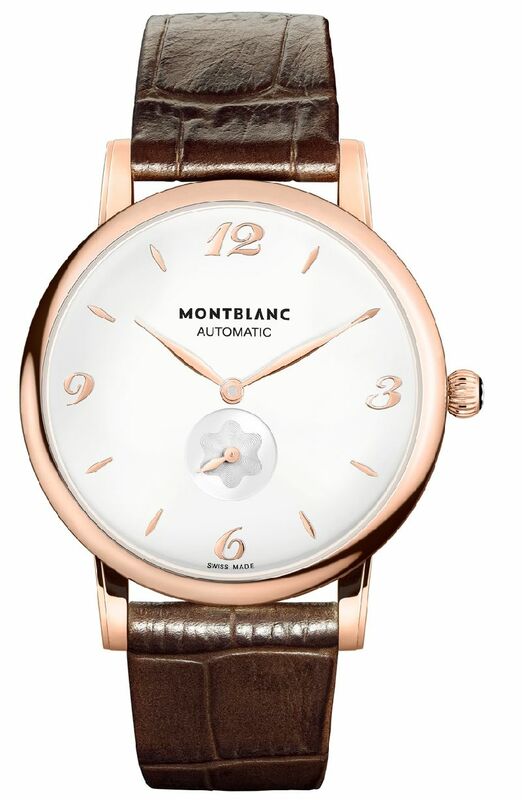 The Star Classique watches will be available in Montblanc boutiques and selected jewelers as of June 2012.